Today we visit the Banks Covered Bridge in Lawrence County. This bridge is located just 20 minutes northeast of the stunning McConnell's Mill Covered Bridge, and it often gets overlooked. It is very beautiful. For those of you who are fans of the West Wing TV show, this area doubled as rural Indiana in the season premier of the fourth season of the show, where President Bartlett (Martin Sheen) kicked off his reelection campaign. A nearby farm was used as a set for a campaign trail speech, and the covered bridge was actually featured in the show. This Burr Arch-Truss bridge measures in at 121 feet long and it crosses the Neshannock Creek, an excellent trout stream that is also has a set of Class II rapids for those who love kayaking and rafting. Just across the way is the Neshannock Falls Road concrete arch bridge. This dates back to 1913 and something about it really caught my eye. As I have gained an appreciation for bridges, I will often stop to check out ones that are out of the ordinary. Here is a small set of falls on a tributary into Neshannock Creek. The Neshannock Gorge is pretty and starts right around the covered bridge. This is a pretty rugged section of creek. Here are some foundations from what I believe was an old furnace that was located along this section of the gorge, but it could also be the remnants of a mill. Both were heavily present within this area. That was my hypothesis. With some research, I have found that this site was the location of the Neshannock (Powers) Furnace, and a later dam and mill. The furnace was built in 1852 and is said to have lasted for 10-12 years. They even have some access areas for kayakers, fisherman, and people who just want to relax by the creek for a little bit. Overall, this is a pretty quiet area that seems to be often overlooked. Nearby there are a number of other cool things to check out including the Wendell August Forge, Springfield Falls, Daffin's Chocolate Kingdom, Harlansburg Train Station Museum, and more. This is an area to spend a laid back day or weekend in. Nearby Seven Sisters Bed and Breakfast is a great place to spend the night in the area. The Pennsylvania Macaroni Company in the Strip District neighborhood of Pittsburgh is a local and family institution. This Italian market was founded by the Sunseri Family all the way back in 1902 as brothers making handmade pasta. The organization has constantly grown ever since, and now they have the makings for every kind of Italian dish that you can think of. As soon as you walk in, you are greeted with the aroma of barrels of fresh herbs that are purchased by the scoopful. If you are looking for anything to make Italian food from scratch, Penn Mac, as it is affectionately referred to by Pittsburghers, is the place to go. If you turn left as you walk in, you head into the cheese room, a market area that has every cheese you can think of. As you continue into the building, you will find many different kinds of olive oil, available fresh from the keg. They offer bottles, or you can bring your own, to fill and use with all of your cooking, and all at a relatively affordable price. They also carry fresh produce and provide local restaurants and markets with food service supplies. Penn Mac is a place that you need to check out if you are visiting the city. If you live in the city, this is a place that you need to frequent if you want to prepare the freshest and most delicious meals. The majority of us put a few strands of lights up. I have always been one to go a little overboard with lights, but Clyde at Leechburg Lights takes it to a level never seen before in the history of mankind. Clyde has a playlist of dozens of songs on a dedicated FM radio channel, that are specifically paired with his light display. Clyde's display is epic to say the least, and mesmerizing to watch. We spent a long time watching his creation and we highly recommend that you go out of your way to do the same. He also has a Halloween display that we will DEFINITELY have to check out sometime. Here is a postcard view of a venue that was the last building completed during Milton Hershey's Great Building Campaign of the 1930s. In the depths of the Great Depression, Milton wanted to reinvest the fortunes of his company into creating employment for workers during the desperate times of the Depression. 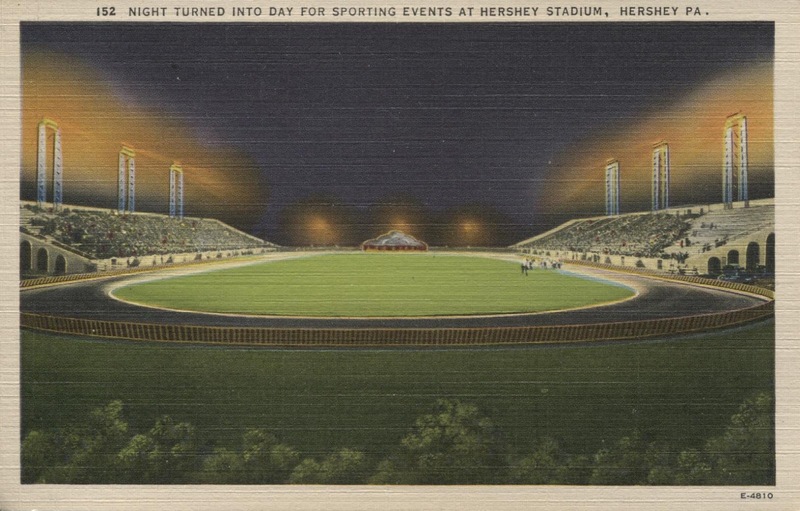 These projects included the Hotel Hershey, Hershey Gardens, Hersheypark Arena, and more. Countless high school football state championship games, concerts, and more, in addition to holding a birthday bash for President Dwight Eisenhower in 1953, have been held at the stadium. This was one of the last major projects that Milton would get to see in his vision of a model company town before his death just six years later. This is a special venue and awesome place to take in an event. If you go for a game, be sure to go visit Hershey's Chocolate World and take in Hersheypark's Christmas Candy Lane. Today we look at Bells Mills Covered Bridge in West Newton, PA, Westmoreland County. This is the one of the rare remaining covered bridges in Westmoreland County.Bells Mills Covered Bridge in Westmoreland County stood in for a covered bridge in Iowa in the classic Meryl Streep and Clint Eastwood film, "Bridges of Madison County." Bells Mills Bridge is in perfect condition. They do a great job keeping it up, and it just looks spectacular. It was a rainy day when we visited. The bridge was built with the Burr Arch-Truss building style and it measures in at 107 feet long. This bridge is easily one of the best maintained in the state. Spectacular bridge. Not many covered bridges have I-Beam height blockers. While kind of an eyesore, I still wish every covered bridge has something like this, so the bridge is protected from oversized vehicles crossing. It is a good way to ensure that the structure remains intact, especially on a heavily used bridge like this one. This is a really stunning bridge that is definitely worth a visit.